The cover image shows an embryonic day 14.5 murine heart immunostained for PROX1 (yellow), VE-cadherin (cyan), and cTnT (red). On page 4899, Chen et al. explore the contributions of VEGF-C to coronary artery stem formation and the interaction between aortic cardiomyocytes and the developing coronary stems. Citation Information: J Clin Invest. 2014;124(11):4671-4672. https://doi.org/10.1172/JCI77973. Citation Information: J Clin Invest. 2014;124(11):4673-4677. https://doi.org/10.1172/JCI74368. Fibrotic disorders account for an increasing burden of disease-associated morbidity and mortality worldwide. Although numerous risk factors have been recognized, the etiologies of many of these clinical syndromes have not been identified, and they are often termed idiopathic or cryptogenic. Here, we provide an evolutionary perspective on fibrosis aimed at elucidating its etiopathogenesis. By asking the ultimate question of “why” this process evolved in multicellular organisms, we hope to uncover proximate explanations for “how” it causes disease in humans. We posit that physiological fibrosis-like reactions evolved as an essential process in host defense against pathogens and in normal wound healing. Based on this premise, we reason that pathological fibrosis is related to one or more of the following: unidentified infectious or noninfectious antigens, autoimmunity, impaired regenerative responses, and the antagonistically pleiotropic action of genes involved in wound healing or development. The importance of genetic susceptibility, epigenetics, aging, and the modern-day environment are highlighted. Consideration of both ultimate and proximate causation goes beyond philosophical cogitations, as it will better inform pathobiological mechanisms of disease and aid in the prevention and treatment of fibrotic diseases. Citation Information: J Clin Invest. 2014;124(11):4684-4686. https://doi.org/10.1172/JCI77986. Atrial fibrillation (AF) is the most common sustained arrhythmia disease. Current drug- and surgical-based therapies are ineffective in about 40% to 50% of AF patients; therefore, there is a great need to better understand the underlying mechanisms of this disease and identify potential therapeutic targets. In this issue of the JCI, Greiser and coworkers discovered that atrial remodeling in response to sustained tachycardia silences Ca2+ signaling in isolated rabbit and human atrial myocytes. This Ca2+ release silencing was attributable to a failure of subcellular propagated Ca2+ release due to an increased cytosolic buffering strength. The results from this study challenge the current paradigm that Ca2+ release instability underlies AF. Instead, Ca2+ silencing could be protective against the massive cellular Ca2+ loading that occurs during chronic AF. Citation Information: J Clin Invest. 2014;124(11):4687-4689. https://doi.org/10.1172/JCI78531. In healthy individuals, cells that lose expression of MHC class I molecules are quickly targeted for elimination by NK lymphocytes. A paradox in cancer immunology is the observation that many tumor cells often have a drastic reduction of MHC class I molecules, yet these cells are not eliminated by NK cells, as they should be. 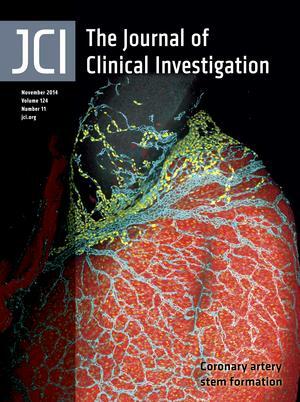 In this issue of the JCI, Ardolino et al. demonstrate that NK cells that infiltrate MHC class I–deficient tumors acquire an anergic state that can be reversed by particular combinations of exogenous cytokines. These results indicate that IL-12 plus IL-18 or a recombinant interleukin engineered to stimulate the IL-2 receptor β/γ heterodimer (but not the IL-2 receptor α/β/γ complex) have the potential to be used clinically to reinstate immunosurveillance against MHC class I–deficient tumors. sFLT1 in preeclampsia: trophoblast defense against a decidual VEGFA barrage? Citation Information: J Clin Invest. 2014;124(11):4690-4692. https://doi.org/10.1172/JCI78532. Preeclampsia, a life-threatening complication of human pregnancy, has a spectrum of clinical signs and is likely caused by an array of pathological mechanisms. However, elevated levels of soluble fms-like tyrosine kinase-1 (sFLT1) in the placenta and in the maternal circulation has emerged as a common finding in women with preeclampsia and likely is a causative factor in this disorder. In this issue of the JCI, Fan and colleagues provide experimental evidence from both humans and mice that suggests placental trophoblast cells overexpress sFLT1 in self defense against excessive VEGFA produced by maternal decidual cells. The authors’ work thus implicates the decidual cells of the mother as the culprit responsible for increased placental expression of sFLT1, a VEGFA antagonist that enters the maternal circulation and consequently induces the clinical signs of preeclampsia. Citation Information: J Clin Invest. 2014;124(11):4693-4708. https://doi.org/10.1172/JCI75199. Nemaline myopathy (NM) is a genetic muscle disorder characterized by muscle dysfunction and electron-dense protein accumulations (nemaline bodies) in myofibers. Pathogenic mutations have been described in 9 genes to date, but the genetic basis remains unknown in many cases. Here, using an approach that combined whole-exome sequencing (WES) and Sanger sequencing, we identified homozygous or compound heterozygous variants in LMOD3 in 21 patients from 14 families with severe, usually lethal, NM. LMOD3 encodes leiomodin-3 (LMOD3), a 65-kDa protein expressed in skeletal and cardiac muscle. LMOD3 was expressed from early stages of muscle differentiation; localized to actin thin filaments, with enrichment near the pointed ends; and had strong actin filament-nucleating activity. Loss of LMOD3 in patient muscle resulted in shortening and disorganization of thin filaments. Knockdown of lmod3 in zebrafish replicated NM-associated functional and pathological phenotypes. Together, these findings indicate that mutations in the gene encoding LMOD3 underlie congenital myopathy and demonstrate that LMOD3 is essential for the organization of sarcomeric thin filaments in skeletal muscle. Citation Information: J Clin Invest. 2014;124(11):4709-4722. https://doi.org/10.1172/JCI76037. Activating mutations in the KRAS oncogene are prevalent in pancreatic ductal adenocarcinoma (PDAC). We previously demonstrated that pancreatic intraepithelial neoplasia (PanIN) formation, which precedes malignant transformation, associates with the expression of immediate early response 3 (Ier3) as part of a prooncogenic transcriptional pathway. Here, we evaluated the role of IER3 in PanIN formation and PDAC development. In human pancreatic cancer cells, IER3 expression efficiently sustained ERK1/2 phosphorylation by inhibiting phosphatase PP2A activity. Moreover, IER3 enhanced KrasG12D-dependent oncogenesis in the pancreas, as both PanIN and PDAC development were delayed in IER3-deficient KrasG12D mice. IER3 expression was discrete in healthy acinar cells, becoming highly prominent in peritumoral acini, and particularly high in acinar ductal metaplasia (ADM) and PanIN lesions, where IER3 colocalized with phosphorylated ERK1/2. However, IER3 was absent in undifferentiated PDAC, which suggests that the IER3-dependent pathway is an early event in pancreatic tumorigenesis. IER3 expression was induced by both mild and severe pancreatitis, which promoted PanIN formation and progression to PDAC in KrasG12D mice. In IER3-deficient mice, pancreatitis abolished KrasG12D-induced proliferation, which suggests that pancreatitis enhances the oncogenic effect of KRAS through induction of IER3 expression. Together, our data indicate that IER3 supports KRASG12D-associated oncogenesis in the pancreas by sustaining ERK1/2 phosphorylation via phosphatase PP2A inhibition. Citation Information: J Clin Invest. 2014;124(11):4723-4736. https://doi.org/10.1172/JCI76126. Familial hyperkalemic hypertension (FHHt) is a monogenic disease resulting from mutations in genes encoding WNK kinases, the ubiquitin scaffold protein cullin 3 (CUL3), or the substrate adaptor kelch-like 3 (KLHL3). Disease-associated CUL3 mutations abrogate WNK kinase degradation in cells, but it is not clear how mutant forms of CUL3 promote WNK stability. Here, we demonstrated that an FHHt-causing CUL3 mutant (CUL3 Δ403–459) not only retains the ability to bind and ubiquitylate WNK kinases and KLHL3 in cells, but is also more heavily neddylated and activated than WT CUL3. In cells, activated CUL3 Δ403–459 depleted KLHL3, preventing WNK degradation, despite increased CUL3-mediated WNK ubiquitylation; therefore, CUL3 loss in kidney should phenocopy FHHt in murine models. As predicted, nephron-specific deletion of Cul3 in mice did increase WNK kinase levels and the abundance of phosphorylated Na-Cl cotransporter (NCC). Over time, however, Cul3 deletion caused renal dysfunction, including hypochloremic alkalosis, diabetes insipidus, and salt-sensitive hypotension, with depletion of sodium potassium chloride cotransporter 2 and aquaporin 2. Moreover, these animals exhibited renal inflammation, fibrosis, and increased cyclin E. These results indicate that FHHt-associated CUL3 Δ403–459 targets KLHL3 for degradation, thereby preventing WNK degradation, whereas general loss of CUL3 activity — while also impairing WNK degradation — has widespread toxic effects in the kidney. Citation Information: J Clin Invest. 2014;124(11):4737-4752. https://doi.org/10.1172/JCI76375. Breast cancers that occur in women 2–5 years postpartum are more frequently diagnosed at metastatic stages and correlate with poorer outcomes compared with breast cancers diagnosed in young, premenopausal women. The molecular mechanisms underlying the malignant severity associated with postpartum breast cancers (ppBCs) are unclear but relate to stromal wound-healing events during postpartum involution, a dynamic process characterized by widespread cell death in milk-producing mammary epithelial cells (MECs). Using both spontaneous and allografted mammary tumors in fully immune–competent mice, we discovered that postpartum involution increases mammary tumor metastasis. Cell death was widespread, not only occurring in MECs but also in tumor epithelium. Dying tumor cells were cleared through receptor tyrosine kinase MerTK–dependent efferocytosis, which robustly induced the transcription of genes encoding wound-healing cytokines, including IL-4, IL-10, IL-13, and TGF-β. Animals lacking MerTK and animals treated with a MerTK inhibitor exhibited impaired efferocytosis in postpartum tumors, a reduction of M2-like macrophages but no change in total macrophage levels, decreased TGF-β expression, and a reduction of postpartum tumor metastasis that was similar to the metastasis frequencies observed in nulliparous mice. Moreover, TGF-β blockade reduced postpartum tumor metastasis. These data suggest that widespread cell death during postpartum involution triggers efferocytosis-induced wound-healing cytokines in the tumor microenvironment that promote metastatic tumor progression. Citation Information: J Clin Invest. 2014;124(11):4753-4758. https://doi.org/10.1172/JCI76838. Hematopoietic stem cells (HSCs) are highly susceptible to ionizing radiation–mediated death via induction of ROS, DNA double-strand breaks, and apoptotic pathways. The development of therapeutics capable of mitigating ionizing radiation–induced hematopoietic toxicity could benefit both victims of acute radiation sickness and patients undergoing hematopoietic cell transplantation. Unfortunately, therapies capable of accelerating hematopoietic reconstitution following lethal radiation exposure have remained elusive. Here, we found that systemic administration of pleiotrophin (PTN), a protein that is secreted by BM-derived endothelial cells, substantially increased the survival of mice following radiation exposure and after myeloablative BM transplantation. In both models, PTN increased survival by accelerating the recovery of BM hematopoietic stem and progenitor cells in vivo. PTN treatment promoted HSC regeneration via activation of the RAS pathway in mice that expressed protein tyrosine phosphatase receptor-zeta (PTPRZ), whereas PTN treatment did not induce RAS signaling in PTPRZ-deficient mice, suggesting that PTN-mediated activation of RAS was dependent upon signaling through PTPRZ. PTN strongly inhibited HSC cycling following irradiation, whereas RAS inhibition abrogated PTN-mediated induction of HSC quiescence, blocked PTN-mediated recovery of hematopoietic stem and progenitor cells, and abolished PTN-mediated survival of irradiated mice. These studies demonstrate the therapeutic potential of PTN to improve survival after myeloablation and suggest that PTN-mediated hematopoietic regeneration occurs in a RAS-dependent manner. Citation Information: J Clin Invest. 2014;124(11):4759-4772. https://doi.org/10.1172/JCI70102. Atrial fibrillation (AF) is characterized by sustained high atrial activation rates and arrhythmogenic cellular Ca2+ signaling instability; however, it is not clear how a high atrial rate and Ca2+ instability may be related. Here, we characterized subcellular Ca2+ signaling after 5 days of high atrial rates in a rabbit model. While some changes were similar to those in persistent AF, we identified a distinct pattern of stabilized subcellular Ca2+ signaling. Ca2+ sparks, arrhythmogenic Ca2+ waves, sarcoplasmic reticulum (SR) Ca2+ leak, and SR Ca2+ content were largely unaltered. Based on computational analysis, these findings were consistent with a higher Ca2+ leak due to PKA-dependent phosphorylation of SR Ca2+ channels (RyR2s), fewer RyR2s, and smaller RyR2 clusters in the SR. We determined that less Ca2+ release per [Ca2+]i transient, increased Ca2+ buffering strength, shortened action potentials, and reduced L-type Ca2+ current contribute to a stunning reduction of intracellular Na+ concentration following rapid atrial pacing. In both patients with AF and in our rabbit model, this silencing led to failed propagation of the [Ca2+]i signal to the myocyte center. We conclude that sustained high atrial rates alone silence Ca2+ signaling and do not produce Ca2+ signaling instability, consistent with an adaptive molecular and cellular response to atrial tachycardia. Citation Information: J Clin Invest. 2014;124(11):4773-4780. https://doi.org/10.1172/JCI70720. There are 3 major sweat-producing glands present in skin; eccrine, apocrine, and apoeccrine glands. Due to the high rate of secretion, eccrine sweating is a vital regulator of body temperature in response to thermal stress in humans; therefore, an inability to sweat (anhidrosis) results in heat intolerance that may cause impaired consciousness and death. Here, we have reported 5 members of a consanguineous family with generalized, isolated anhidrosis, but morphologically normal eccrine sweat glands. Whole-genome analysis identified the presence of a homozygous missense mutation in ITPR2, which encodes the type 2 inositol 1,4,5-trisphosphate receptor (InsP3R2), that was present in all affected family members. We determined that the mutation is localized within the pore forming region of InsP3R2 and abrogates Ca2+ release from the endoplasmic reticulum, which suggests that intracellular Ca2+ release by InsP3R2 in clear cells of the sweat glands is important for eccrine sweat production. Itpr2–/– mice exhibited a marked reduction in sweat secretion, and evaluation of sweat glands from Itpr2–/– animals revealed a decrease in Ca2+ response compared with controls. Together, our data indicate that loss of InsP3R2-mediated Ca2+ release causes isolated anhidrosis in humans and suggest that specific InsP3R inhibitors have the potential to reduce sweat production in hyperhidrosis. Citation Information: J Clin Invest. 2014;124(11):4781-4794. https://doi.org/10.1172/JCI74337. Various cytokines have been evaluated as potential anticancer drugs; however, most cytokine trials have shown relatively low efficacy. Here, we found that treatments with IL-12 and IL-18 or with a mutant form of IL-2 (the “superkine” called H9) provided substantial therapeutic benefit for mice specifically bearing MHC class I–deficient tumors, but these treatments were ineffective for mice with matched MHC class I+ tumors. Cytokine efficacy was linked to the reversal of the anergic state of NK cells that specifically occurred in MHC class I–deficient tumors, but not MHC class I+ tumors. NK cell anergy was accompanied by impaired early signal transduction and was locally imparted by the presence of MHC class I–deficient tumor cells, even when such cells were a minor population in a tumor mixture. These results demonstrate that MHC class I–deficient tumor cells can escape from the immune response by functionally inactivating NK cells, and suggest cytokine-based immunotherapy as a potential strategy for MHC class I–deficient tumors. These results suggest that such cytokine therapies would be optimized by stratification of patients. Moreover, our results suggest that such treatments may be highly beneficial in the context of therapies to enhance NK cell functions in cancer patients. Citation Information: J Clin Invest. 2014;124(11):4795-4806. https://doi.org/10.1172/JCI76737. Patients with type 2 diabetes often present with cardiovascular complications; however, it is not clear how diabetes promotes cardiac dysfunction. In murine models, deletion of the gene encoding aryl hydrocarbon nuclear translocator (ARNT, also known as HIF1β) in the liver or pancreas leads to a diabetic phenotype; however, the role of ARNT in cardiac metabolism is unknown. Here, we determined that cardiac-specific deletion of Arnt in adult mice results in rapid development of cardiomyopathy (CM) that is characterized by accumulation of lipid droplets. Compared with hearts from ARNT-expressing mice, ex vivo analysis of ARNT-deficient hearts revealed a 2-fold increase in fatty acid (FA) oxidation as well as a substantial increase in the expression of PPARα and its target genes. Furthermore, deletion of both Arnt and Ppara preserved cardiac function, improved survival, and completely reversed the FA accumulation phenotype, indicating that PPARα mediates the detrimental effects of Arnt deletion in the heart. Finally, we determined that ARNT directly regulates Ppara expression by binding to its promoter and forming a complex with HIF2α. Together, these findings suggest that ARNT is a critical regulator of myocardial FA metabolism and that its deletion leads to CM and an increase in triglyceride accumulation through PPARα. Citation Information: J Clin Invest. 2014;124(11):4807-4822. https://doi.org/10.1172/JCI76492. Citation Information: J Clin Invest. 2014;124(11):4823-4828. https://doi.org/10.1172/JCI77685. Transport of oxygen by red blood cells (rbc) is critical for life and embryogenesis. Here, we determined that provision of the lipid mediator sphingosine 1-phosphate (S1P) to the systemic circulation is an essential function of rbc in embryogenesis. Mice with rbc-specific deletion of sphingosine kinases 1 and 2 (Sphk1 and Sphk2) showed embryonic lethality between E11.5 and E12.5 due to defects in vascular development. Administration of an S1P1 receptor agonist to pregnant dams rescued early embryonic lethality. Even though rbc-specific Sphk1 Sphk2–KO embryos were anemic, the erythropoietic capacity of hematopoietic stem cells (HSCs) was not impaired, suggesting that rbc can develop in the absence of sphingosine kinase activity. Indeed, transplantation of HSCs deficient for Sphk1 and Sphk2 into adult mice produced rbc that lacked S1P and attenuated plasma S1P levels in recipients. However, in adult animals, both rbc and endothelium contributed to plasma S1P. Together, these findings demonstrate that rbc are essential for embryogenesis by supplying the lysophospholipid S1P, which regulates embryonic vascular development via its receptors. Citation Information: J Clin Invest. 2014;124(11):4829-4842. https://doi.org/10.1172/JCI68506. Cholestenoic acids are formed as intermediates in metabolism of cholesterol to bile acids, and the biosynthetic enzymes that generate cholestenoic acids are expressed in the mammalian CNS. Here, we evaluated the cholestenoic acid profile of mammalian cerebrospinal fluid (CSF) and determined that specific cholestenoic acids activate the liver X receptors (LXRs), enhance islet-1 expression in zebrafish, and increase the number of oculomotor neurons in the developing mouse in vitro and in vivo. While 3β,7α-dihydroxycholest-5-en-26-oic acid (3β,7α-diHCA) promoted motor neuron survival in an LXR-dependent manner, 3β-hydroxy-7-oxocholest-5-en-26-oic acid (3βH,7O-CA) promoted maturation of precursors into islet-1+ cells. Unlike 3β,7α-diHCA and 3βH,7O-CA, 3β-hydroxycholest-5-en-26-oic acid (3β-HCA) caused motor neuron cell loss in mice. Mutations in CYP7B1 or CYP27A1, which encode enzymes involved in cholestenoic acid metabolism, result in different neurological diseases, hereditary spastic paresis type 5 (SPG5) and cerebrotendinous xanthomatosis (CTX), respectively. SPG5 is characterized by spastic paresis, and similar symptoms may occur in CTX. Analysis of CSF and plasma from patients with SPG5 revealed an excess of the toxic LXR ligand, 3β-HCA, while patients with CTX and SPG5 exhibited low levels of the survival-promoting LXR ligand 3β,7α-diHCA. Moreover, 3β,7α-diHCA prevented the loss of motor neurons induced by 3β-HCA in the developing mouse midbrain in vivo.Our results indicate that specific cholestenoic acids selectively work on motor neurons, via LXR, to regulate the balance between survival and death. Citation Information: J Clin Invest. 2014;124(11):4843-4856. https://doi.org/10.1172/JCI75894. FUNDING. NIAID, NIH UM1AI068618, AI068635, AI068614, and AI069443. Citation Information: J Clin Invest. 2014;124(11):4857-4866. https://doi.org/10.1172/JCI74428. The transmembrane activator and calcium-modulating cyclophilin ligand interactor (TACI) controls differentiation of long-lived plasma cells, and almost 10% of individuals with common variable immunodeficiency (CVID) express either the C104R or A181E variants of TACI. These variants impair TACI function, and TACI-deficient mice exhibit a CVID-like disease. However, 1%–2% of normal individuals harbor the C140R or A181E TACI variants and have no outward signs of CVID, and it is not clear why TACI deficiency in this group does not cause disease. Here, we determined that TACI-deficient mice have low baseline levels of Ig in the blood but retain the ability to mutate Ig-associated genes that encode antigen-specific antibodies. The antigen-specific antibodies in TACI-deficient mice were produced in bursts and had higher avidity than those of WT animals. Moreover, mice lacking TACI were able to clear Citrobacter rodentium, a model pathogen for severe human enteritis, more rapidly than did WT mice. These findings suggest that the high prevalence of TACI deficiency in humans might reflect enhanced host defense against enteritis, which is more severe in those with acquired or inherited immunodeficiencies. Citation Information: J Clin Invest. 2014;124(11):4867-4876. https://doi.org/10.1172/JCI75328. Chronic graft-versus-host disease (cGVHD) is a life-threatening impediment to allogeneic hematopoietic stem cell transplantation, and current therapies do not completely prevent and/or treat cGVHD. CD4+ T cells and B cells mediate cGVHD; therefore, targeting these populations may inhibit cGVHD pathogenesis. Ibrutinib is an FDA-approved irreversible inhibitor of Bruton’s tyrosine kinase (BTK) and IL-2 inducible T cell kinase (ITK) that targets Th2 cells and B cells and produces durable remissions in B cell malignancies with minimal toxicity. Here, we evaluated whether ibrutinib could reverse established cGVHD in 2 complementary murine models, a model interrogating T cell–driven sclerodermatous cGVHD and an alloantibody-driven multiorgan system cGVHD model that induces bronchiolar obliterans (BO). In the T cell–mediated sclerodermatous cGVHD model, ibrutinib treatment delayed progression, improved survival, and ameliorated clinical and pathological manifestations. In the alloantibody-driven cGVHD model, ibrutinib treatment restored pulmonary function and reduced germinal center reactions and tissue immunoglobulin deposition. Animals lacking BTK and ITK did not develop cGVHD, indicating that these molecules are critical to cGVHD development. Furthermore, ibrutinib treatment reduced activation of T and B cells from patients with active cGVHD. Our data demonstrate that B cells and T cells drive cGVHD and suggest that ibrutinib has potential as a therapeutic agent, warranting consideration for cGVHD clinical trials. Citation Information: J Clin Invest. 2014;124(11):4877-4881. https://doi.org/10.1172/JCI75109. Patients with cerebral small-vessel disease (CSVD) exhibit perturbed end-artery function and have an increased risk for stroke and age-related cognitive decline. Here, we used targeted genome-wide association (GWA) analysis and defined a CSVD locus adjacent to the forkhead transcription factor FOXC1. Moreover, we determined that the linked SNPs influence FOXC1 transcript levels and demonstrated that patients as young as 1 year of age with altered FOXC1 function exhibit CSVD. MRI analysis of patients with missense and nonsense mutations as well as FOXC1-encompassing segmental duplication and deletion revealed white matter hyperintensities, dilated perivascular spaces, and lacunar infarction. In a zebrafish model, overexpression or morpholino-induced suppression of foxc1 induced cerebral hemorrhage. Inhibition of foxc1 perturbed platelet-derived growth factor (Pdgf) signaling, impairing neural crest migration and the recruitment of mural cells, which are essential for vascular stability. GWA analysis also linked the FOXC1-interacting transcription factor PITX2 to CSVD, and both patients with PITX2 mutations and murine Pitx2–/– mutants displayed brain vascular phenotypes. Together, these results extend the genetic etiology of stroke and demonstrate an increasing developmental basis for human cerebrovascular disease. Citation Information: J Clin Invest. 2014;124(11):4882-4894. https://doi.org/10.1172/JCI73530. The lymphatic system is an important route for cancer dissemination, and lymph node metastasis (LNM) serves as a critical prognostic determinant in cancer patients. We investigated the contribution of COX-2–derived prostaglandin E2 (PGE2) in the formation of a premetastatic niche and LNM. A murine model of Lewis lung carcinoma (LLC) cell metastasis revealed that COX-2 is expressed in DCs from the early stage in the lymph node subcapsular regions, and COX-2 inhibition markedly suppressed mediastinal LNM. Stromal cell–derived factor-1 (SDF-1) was elevated in DCs before LLC cell infiltration to the lymph nodes, and a COX-2 inhibitor, an SDF-1 antagonist, and a CXCR4 neutralizing antibody all reduced LNM. Moreover, LNM was reduced in mice lacking the PGE2 receptor EP3, and stimulation of cultured DCs with an EP3 agonist increased SDF-1 production. Compared with WT CD11c+ DCs, injection of EP3-deficient CD11c+ DCs dramatically reduced accumulation of SDF-1+CD11c+ DCs in regional LNs and LNM in LLC-injected mice. Accumulation of Tregs and lymph node lymphangiogenesis, which may influence the fate of metastasized tumor cells, was also COX-2/EP3–dependent. These results indicate that DCs induce a premetastatic niche during LNM via COX-2/EP3–dependent induction of SDF-1 and suggest that inhibition of this signaling axis may be an effective strategy to suppress premetastatic niche formation and LNM. Citation Information: J Clin Invest. 2014;124(11):4895-4898. https://doi.org/10.1172/JCI76658. The intracellular scaffold protein IQGAP1 supports protein complexes in conjunction with numerous binding partners involved in multiple cellular processes. Here, we determined that IQGAP1 modulates airway smooth muscle contractility. Compared with WT controls, at baseline as well as after immune sensitization and challenge, Iqgap1–/– mice had higher airway responsiveness. Tracheal rings from Iqgap1–/– mice generated greater agonist-induced contractile force, even after removal of the epithelium. RhoA, a regulator of airway smooth muscle contractility, was activated in airway smooth muscle lysates from Iqgap1–/– mice. Likewise, knockdown of IQGAP1 in primary human airway smooth muscle cells increased RhoA activity. Immunoprecipitation studies indicated that IQGAP1 binds to both RhoA and p190A-RhoGAP, a GTPase-activating protein that normally inhibits RhoA activation. Proximity ligation assays in primary airway human smooth muscle cells and mouse tracheal sections revealed colocalization of p190A-RhoGAP and RhoA; however, these proteins did not colocalize in IQGAP1 knockdown cells or in Iqgap1–/– trachea. Compared with healthy controls, human subjects with asthma had decreased IQGAP1 expression in airway biopsies. Together, these data demonstrate that IQGAP1 acts as a scaffold that colocalizes p190A-RhoGAP and RhoA, inactivating RhoA and suppressing airway smooth muscle contraction. Furthermore, our results suggest that IQGAP1 has the potential to modulate airway contraction severity in acute asthma. Citation Information: J Clin Invest. 2014;124(11):4899-4914. https://doi.org/10.1172/JCI77483. Coronary arteries (CAs) stem from the aorta at 2 highly stereotyped locations, deviations from which can cause myocardial ischemia and death. CA stems form during embryogenesis when peritruncal blood vessels encircle the cardiac outflow tract and invade the aorta, but the underlying patterning mechanisms are poorly understood. Here, using murine models, we demonstrated that VEGF-C–deficient hearts have severely hypoplastic peritruncal vessels, resulting in delayed and abnormally positioned CA stems. We observed that VEGF-C is widely expressed in the outflow tract, while cardiomyocytes develop specifically within the aorta at stem sites where they surround maturing CAs in both mouse and human hearts. Mice heterozygous for islet 1 (Isl1) exhibited decreased aortic cardiomyocytes and abnormally low CA stems. In hearts with outflow tract rotation defects, misplaced stems were associated with shifted aortic cardiomyocytes, and myocardium induced ectopic connections with the pulmonary artery in culture. These data support a model in which CA stem development first requires VEGF-C to stimulate vessel growth around the outflow tract. Then, aortic cardiomyocytes facilitate interactions between peritruncal vessels and the aorta. Derangement of either step can lead to mispatterned CA stems. Studying this niche for cardiomyocyte development, and its relationship with CAs, has the potential to identify methods for stimulating vascular regrowth as a treatment for cardiovascular disease. Citation Information: J Clin Invest. 2014;124(11):4915-4925. https://doi.org/10.1172/JCI74830. Citation Information: J Clin Invest. 2014;124(11):4926-4940. https://doi.org/10.1172/JCI72853. Microbial clearance by eukaryotes relies on complex and coordinated processes that remain poorly understood. The gasotransmitter carbon monoxide (CO) is generated by the stress-responsive enzyme heme oxygenase-1 (HO-1, encoded by Hmox1), which is highly induced in macrophages in response to bacterial infection. HO-1 deficiency results in inadequate pathogen clearance, exaggerated tissue damage, and increased mortality. Here, we determined that macrophage-generated CO promotes ATP production and release by bacteria, which then activates the Nacht, LRR, and PYD domains-containing protein 3 (NALP3) inflammasome, intensifying bacterial killing. Bacterial killing defects in HO-1–deficient murine macrophages were restored by administration of CO. Moreover, increased CO levels enhanced the bacterial clearance capacity of human macrophages and WT murine macrophages. CO-dependent bacterial clearance required the NALP3 inflammasome, as CO did not increase bacterial killing in macrophages isolated from NALP3-deficient or caspase-1–deficient mice. IL-1β cleavage and secretion were impaired in HO-1–deficient macrophages, and CO-dependent processing of IL-1β required the presence of bacteria-derived ATP. We found that bacteria remained viable to generate and release ATP in response to CO. The ATP then bound to macrophage nucleotide P2 receptors, resulting in activation of the NALP3/IL-1β inflammasome to amplify bacterial phagocytosis by macrophages. Taken together, our results indicate that macrophage-derived CO permits efficient and coordinated regulation of the host innate response to invading microbes. Citation Information: J Clin Invest. 2014;124(11):4941-4952. https://doi.org/10.1172/JCI76864. Citation Information: J Clin Invest. 2014;124(11):4953-4964. https://doi.org/10.1172/JCI75456. Citation Information: J Clin Invest. 2014;124(11):4965-4975. https://doi.org/10.1172/JCI75660. Sensitization to foods often occurs in infancy, without a known prior oral exposure, suggesting that alternative exposure routes contribute to food allergy. Here, we tested the hypothesis that peanut proteins activate innate immune pathways in the skin that promote sensitization. We exposed mice to peanut protein extract on undamaged areas of skin and observed that repeated topical exposure to peanut allergens led to sensitization and anaphylaxis upon rechallenge. In mice, this epicutaneous peanut exposure induced sensitization to the peanut components Ara h 1 and Ara h 2, which is also observed in human peanut allergy. Both crude peanut extract and Ara h 2 alone served as adjuvants, as both induced a bystander sensitization that was similar to that induced by the atopic dermatitis-associated staphylococcal enterotoxin B. In cultured human keratinocytes and in murine skin, peanut extract directly induced cytokine expression. Moreover, topical peanut extract application induced an alteration dependent on the IL-33 receptor ST2 in skin-draining DCs, resulting in Th2 cytokine production from T cells. Together, our data support the hypothesis that peanuts are allergenic due to inherent adjuvant activity and suggest that skin exposure to food allergens contributes to sensitization to foods in early life. Citation Information: J Clin Invest. 2014;124(11):4976-4988. https://doi.org/10.1172/JCI75667. The signal-responsive E3 ubiquitin ligase pellino 1 (PELI1) regulates TLR and T cell receptor (TCR) signaling and contributes to the maintenance of autoimmunity; however, little is known about the consequence of mutations that result in upregulation of PELI1. Here, we developed transgenic mice that constitutively express human PELI1 and determined that these mice have a shorter lifespan due to tumor formation. Constitutive expression of PELI1 resulted in ligand-independent hyperactivation of B cells and facilitated the development of a wide range of lymphoid tumors, with prominent B cell infiltration observed across multiple organs. PELI1 directly interacted with the oncoprotein B cell chronic lymphocytic leukemia (BCL6) and induced lysine 63–mediated BCL6 polyubiquitination. In samples from patients with diffuse large B cell lymphomas (DLBCLs), PELI1 expression levels positively correlated with BCL6 expression, and PELI1 overexpression was closely associated with poor prognosis in DLBCLs. Together, these results suggest that increased PELI1 expression and subsequent induction of BCL6 promotes lymphomagenesis and that this pathway may be a potential target for therapeutic strategies to treat B cell lymphomas. Citation Information: J Clin Invest. 2014;124(11):4989-5001. https://doi.org/10.1172/JCI76042. Ischemia is a leading cause of acute kidney injury. Kidney ischemia is associated with loss of cellular ion homeostasis; however, the pathways that underlie ion homeostasis dysfunction are poorly understood. Here, we evaluated the nonselective cation channel transient receptor potential melastatin 2 (TRPM2) in a murine model of kidney ischemia/reperfusion (I/R) injury. TRPM2-deficient mice were resistant to ischemic injury, as reflected by improved kidney function, reduced histologic damage, suppression of proapoptotic pathways, and reduced inflammation. Moreover, pharmacologic TRPM2 inhibition was also protective against I/R injury. TRPM2 was localized mainly in kidney proximal tubule epithelial cells, and studies in chimeric mice indicated that the effects of TRPM2 are due to expression in parenchymal cells rather than hematopoietic cells. TRPM2-deficient mice had less oxidative stress and lower levels of NADPH oxidase activity after ischemia. While RAC1 is a component of the NADPH oxidase complex, its relation to TRPM2 and kidney ischemic injury is unknown. Following kidney ischemia, TRPM2 promoted RAC1 activation, with active RAC1 physically interacting with TRPM2 and increasing TRPM2 expression at the cell membrane. Finally, inhibition of RAC1 reduced oxidant stress and ischemic injury in vivo. These results demonstrate that TRPM2-dependent RAC1 activation increases oxidant stress and suggest that therapeutic approaches targeting TRPM2 and/or RAC1 may be effective in reducing ischemic kidney injury. Citation Information: J Clin Invest. 2014;124(11):5002-5012. https://doi.org/10.1172/JCI77126. Levels of pituitary growth hormone (GH), a metabolic homeostatic factor with strong lipolytic activity, are decreased in obese individuals. GH declines prior to the onset of weight gain in response to excess caloric intake and hyperinsulinemia; however, the mechanism by which GH is reduced is not clear. We used transgenic mice expressing the human GH (hGH) gene, GH1, to assess the effect of high caloric intake on expression as well as the local chromosome structure of the intact GH1 locus. Animals exposed to 3 days of high caloric intake exhibited hyperinsulinemia without hyperglycemia and a decrease in both hGH synthesis and secretion, but no difference in endogenous production of murine GH. Efficient GH1 expression requires a long-range intrachromosomal interaction between remote enhancer sequences and the proximal promoter region through “looping” of intervening chromatin. High caloric intake disrupted this interaction and decreased both histone H3/H4 hyperacetylation and RNA polymerase II occupancy at the GH1 promoter. Incorporation of physical activity muted the effects of excess caloric intake on insulin levels, GH1 promoter hyperacetylation, chromosomal architecture, and expression. These results indicate that energy homeostasis alters postnatal hGH synthesis through dynamic changes in the 3-dimensional chromatin structure of the GH1 locus, including structures required for cell type specificity during development. Citation Information: J Clin Invest. 2014;124(11):5013-5026. https://doi.org/10.1172/JCI76412. A major clinical hurdle for the management of advanced prostate cancer (PCa) in patients is the resistance of tumors to androgen deprivation therapy (ADT) and their subsequent development into castration-resistant prostate cancer (CRPC). While recent studies have identified potential pathways involved in CRPC development, the drivers of CRPC remain largely undefined. Here we determined that nuclear receptor coactivator 2 (NCoA2, also known as SRC-2), which is frequently amplified or overexpressed in patients with metastatic PCa, mediates development of CRPC. In a murine model, overexpression of NCoA2 in the prostate epithelium resulted in neoplasia and, in combination with Pten deletion, promoted the development of metastasis-prone cancer. Moreover, depletion of NCoA2 in PTEN-deficient mice prevented the development of CRPC. In human androgen-sensitive prostate cancer cells, androgen signaling suppressed NCoA2 expression, and NCoA2 overexpression in murine prostate tumors resulted in hyperactivation of PI3K/AKT and MAPK signaling, promoting tumor malignance. Analysis of PCa patient samples revealed a strong correlation among NCoA2-mediated signaling, disease progression, and PCa recurrence. Taken together, our findings indicate that androgen deprivation induces NCoA2, which in turn mediates activation of PI3K signaling and promotes PCa metastasis and CRPC development. Moreover, these results suggest that the inhibition of NCoA2 has potential for PCa therapy. Citation Information: J Clin Invest. 2014;124(11):5027-5036. https://doi.org/10.1172/JCI77495. Cardiac Purkinje cells are important triggers of ventricular arrhythmias associated with heritable and acquired syndromes; however, the mechanisms responsible for this proarrhythmic behavior are incompletely understood. Here, through transcriptional profiling of genetically labeled cardiomyocytes, we identified expression of Purkinje cell protein-4 (Pcp4), a putative regulator of calmodulin and Ca2+/calmodulin-dependent kinase II (CaMKII) signaling, exclusively within the His-Purkinje network. Using Pcp4-null mice and acquired cardiomyopathy models, we determined that reduced expression of PCP4 is associated with CaMKII activation, abnormal electrophysiology, dysregulated intracellular calcium handling, and proarrhythmic behavior in isolated Purkinje cells. Pcp4-null mice also displayed profound autonomic dysregulation and arrhythmic behavior in vivo. Together, these results demonstrate that PCP4 regulates cardiac excitability through both Purkinje cell–autonomous and central mechanisms and identify this modulator of CaMKII signaling as a potential arrhythmia-susceptibility candidate. Citation Information: J Clin Invest. 2014;124(11):5037-5041. https://doi.org/10.1172/JCI77843. Allergic contact dermatitis (ACD) is well recognized as an adverse event associated with implantable medical devices that contain allergenic materials like nickel; however, other cutaneous consequences of chronic exposure to allergens in implanted devices are not well understood. Here, we present a clinical case of Marjolin’s ulcer, an invasive squamous cell carcinoma (SCC) that developed in response to chronic ACD caused by an orthopedic implant. We used a standard murine model of contact hypersensitivity to determine whether chronic ACD promotes skin carcinogenesis. Chronic application of 1-fluoro-2,4-dinitrobenzene (DNFB) to carcinogen-treated skin led to the development of papillomas and aggressive SCC. DNFB-driven chronic ACD was marked by type 2 inflammation, which mediated skin carcinogenesis, as mice unable to mount an inflammatory response were less likely to develop skin tumors. Importantly, we found similar tumor-promoting inflammation surrounding the SCC in our patient. Our findings demonstrate that chronic ACD caused by constant exposure to an allergen can promote tumorigenesis at skin sites with preexisting cancer-initiated cells. Moreover, our results suggest that patients with implantable devices placed in close proximity to the skin should be monitored for ACD and highlight the importance of patch testing prior to the placement of such devices. Citation Information: J Clin Invest. 2014;124(11):5042-5056. https://doi.org/10.1172/JCI71385. In patients with multiple sclerosis (MS) and mice with experimental autoimmune encephalomyelitis (EAE), inflammatory axonal injury is a major determinant of disability; however, the drivers of this injury are incompletely understood. Here, we used the EAE model and determined that the extracellular matrix protein matrilin-2 (MATN2) is an endogenous neuronal molecule that is regulated in association with inflammatory axonal injury. Compared with WT mice, mice harboring a deletion of Matn2 exhibited reduced disease severity and axon damage following induction of EAE. Evaluation of neuron-macrophage cocultures revealed that exogenous MATN2 specifically signals through TLR4 and directly induces expression of proinflammatory genes in macrophages, promoting axonal damage. Moreover, the MATN2-induced proinflammatory response was attenuated greatly in macrophages from Myd88 KO mice. Examination of brain sections from patients with MS revealed that MATN2 is expressed in lesions but not in normal-appearing white matter. Together, our results indicate that MATN2 is a deleterious endogenous neuroaxonal injury response signal that activates innate immune cells and could contribute to early axonal damage in CNS inflammatory diseases like MS.
Citation Information: J Clin Invest. 2014;124(11):5057-5073. https://doi.org/10.1172/JCI71882. Osteoclastogenesis requires activation of RANK signaling as well as costimulatory signals from immunoreceptor tyrosine-based activation motif-containing (ITAM-containing) receptors/adaptors, predominantly tyrosine kinase–binding proteins DAP12 and FcRγ, in osteoclast precursors. It is not well understood how costimulatory signals are regulated and integrated with RANK signaling. Here, we found that osteopetrotic bone phenotypes in mice lacking DAP12 or DAP12 and FcRγ are mediated by the transcription factor RBP-J, as deletion of Rbpj in these mice substantially rescued the defects of bone remodeling. Using a TNF-α–induced model of inflammatory bone resorption, we determined that RBP-J deficiency enables TNF-α to induce osteoclast formation and bone resorption in DAP12-deficient animals. Thus, RBP-J imposes a requirement for ITAM-mediated costimulation of RANKL or TNF-α–induced osteoclastogenesis. Mechanistically, RBP-J suppressed induction of key osteoclastogenic factors NFATc1, BLIMP1, and c-FOS by inhibiting ITAM-mediated expression and function of PLCγ2 and activation of downstream calcium-CaMKK/PYK2 signaling. Moreover, RBP-J suppressed Plcg2 expression and downstream calcium oscillations indirectly by a TGF-β/PLCγ2/calcium axis. Together, our findings indicate that RBP-J suppresses ITAM-mediated costimulation, thereby limiting crosstalk between ITAM and RANK/TNFR signaling and allowing fine tuning of osteoclastogenesis during bone homeostasis and under inflammatory conditions. Furthermore, these data suggest that environmental cues that regulate RBP-J expression/function potentially modulate the requirement for costimulatory signaling for osteoclast differentiation and bone remodeling. Citation Information: J Clin Invest. 2014;124(11):5074-5084. https://doi.org/10.1172/JCI76539. Citation Information: J Clin Invest. 2014;124(11):5085-5085. https://doi.org/10.1172/JCI79236. Citation Information: J Clin Invest. 2014;124(11):5085-5085. https://doi.org/10.1172/JCI79469.